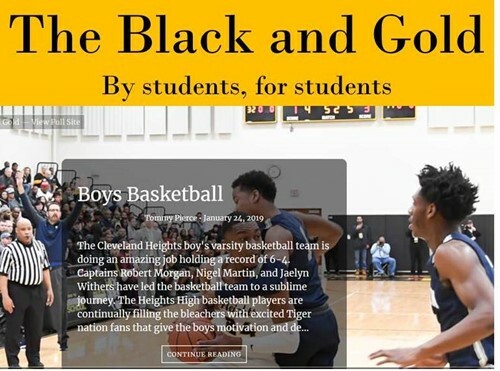 Feb. 5, 2019 -- The latest issue of the Heights High school pubication, Black and Gold is available. This issue includes articles about both the girls and boys basketball teams, by Tommy Pierce, a review of the school’s Holiday Open House by Italie Demore, tips on preparing for the ACT and SAT college entrance tests by Hannah Teets and an overview of Mr. Wiggins’ AP Government field trip to the Ohio Statehouse in Columbus by Abra Lisowski and Hannah Teets. Read the Black and Gold. The publication is produced by the School Publications class and students in the Black and Gold club. Jessica Tayse is the journalism teacher. Students in the class also publish the school’s yearbook, The Cauldron. Nancy Rich is the yearbook teacher.